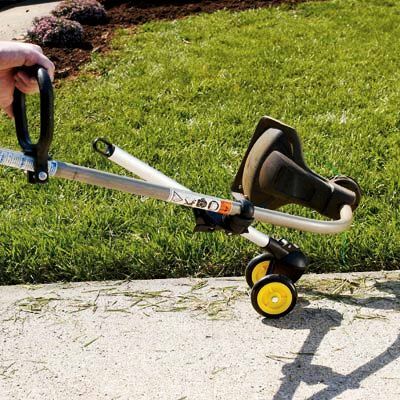 The Trimmer Trolley is a line trimmer wheel attachment and stability system that transforms your gas powered line trimmer into many effective yard care tools. The design helps to reduce back fatigue, which helps to reduce back, shoulder and neck pain so common with yard work and trimmers! You will be amazed at what it does for your posture, just stand up straight and wheel it along. More than just wheels, this is a complete solution, transforming your weed and grass trimmer into a very versatile grass mowing machine, a grass edger, a lawn trimmer and a lot more. The patented heavy duty design allows an infinite number of angles and cutting positions to fit any cutting and trimming styles required. The Trimmer Trolley maintains perfect balance and reduces the weight on the user. This helps in achieving precise control and a consistent cutting height. The end result is a lawn that appears to have been professionally manicured and landscaped. The Trimmer Trolley system is simple, easy, light weight and rugged. It is designed and built for many years of lawn care and trimming service. Fits most line trimmers by Briggs, Bolens, Cub Cadet, Echo, Homelite, Honda, Husqvarna, Kawasaki, Makita, McCulloch, Pope, Poulon, Red Max, Ryobi, Sears, Stihl, Toro, Troy-Built, Weedeater and more!